Cover A by Agnes Garbowska. Cover B by Philip Murphy. Grab your magnifying glass and trenchcoat — it’s time to explore the exciting mysteries of Ponyville! IDW Publishing has asked us to share with you a first look at their brand-new miniseries, My Little Pony: Ponyville Mysteries! The Cutie Mark Crusaders decide to put their deductive minds to work in order to solve the many mysteries surrounding Ponyville! 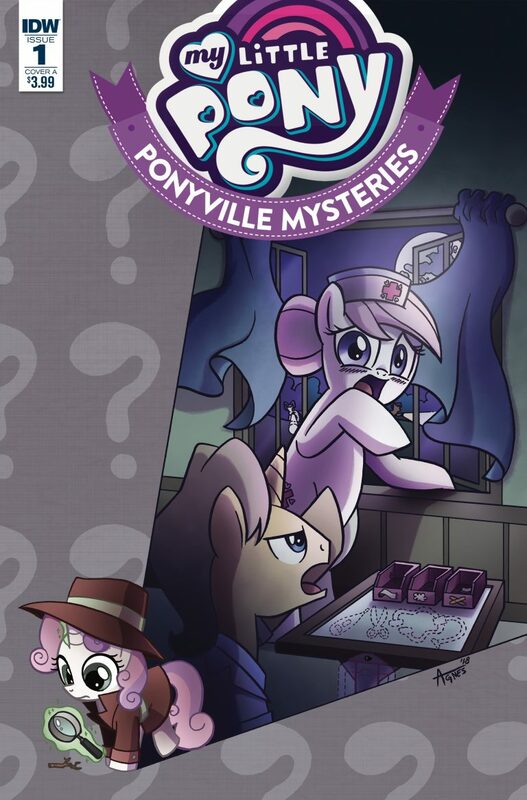 Get an eyeglass full of this lovely cover by Agnes Garbowska, and be sure to ask your local comic book store for your very own copy of My Little Pony: Ponyville Mysteries #1, out this May! From IDW Publishing: Welcome to a new series of mystery and intrigue! The Cutie Mark Crusaders discover their inner detectives and solve crimes nopony else can! Will they be able to discover who is stealing supplies from Ponyville hospital and get their schoolwork done at the same time? *Retailers: See your order form for incentive information. Retail incentives: Order 10 copies, get one free variant cover by Andy Price! Order 20 copies, get one free variant cover by Brenda Hickey!